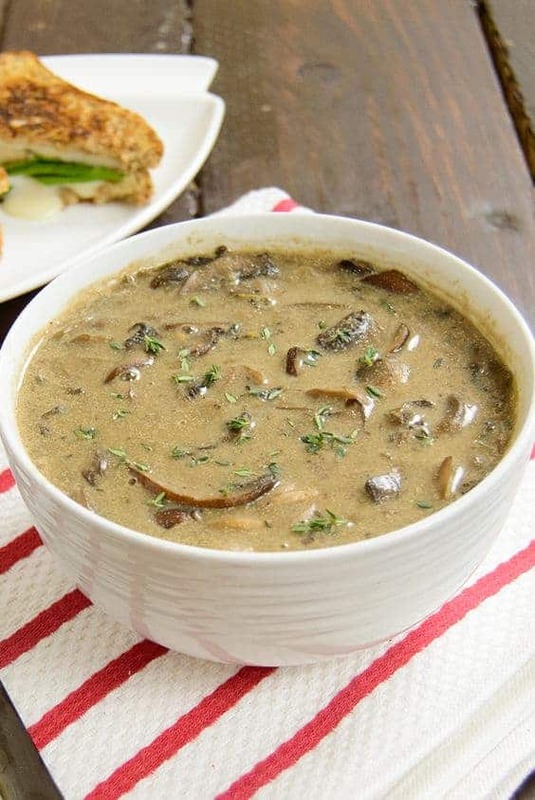 This IS the BEST Mushroom Soup ever! Sooo…. with that said I would like to put my 2 cents in ! If only more people would cook like this, the world would be a Healthier place ! Has anyone tried to make this in a crockpot or instapot? My 8 yr old daughter loved this soup so much she ate up the whole batch before my husband could get any! Making a double batch this time! 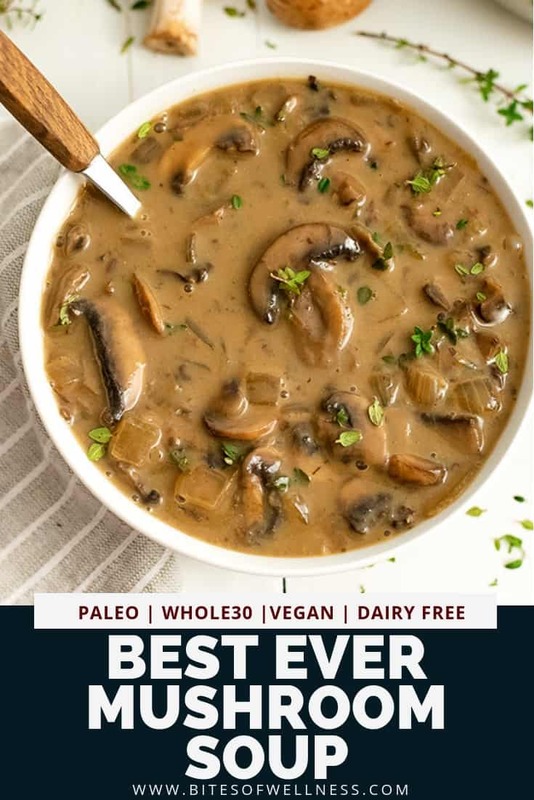 This was truly the best mushroom soup and it was so easy to make. I thought for sure it would make more than 2 servings, but the mushrooms cook down so much that serving 2 was just perfect. I added some hot sauce to my bowl to kick it up a notch. Pinned it to my Pinterest page so hopefully others will find it. Thanks Doug! So excited you enjoyed it! This recipe looks great, Im planning to make it for a local fundraiser and need to make a lot. Can you tell me how much soup this makes? The recipe says 2 servings but doesnt list the service size. This was delicious! I added an extra 1/2 cup of both the broth and the almond milk, another tbsp of corn starch (I didn’t have tapioca flour) and some white pepper. Perfection-thank you so much for this recipe! Sounds amazing, Charleen! So happy you enjoyed it! TOTALLY the best ever! And I eat mushrooms every day (Fuhrman). 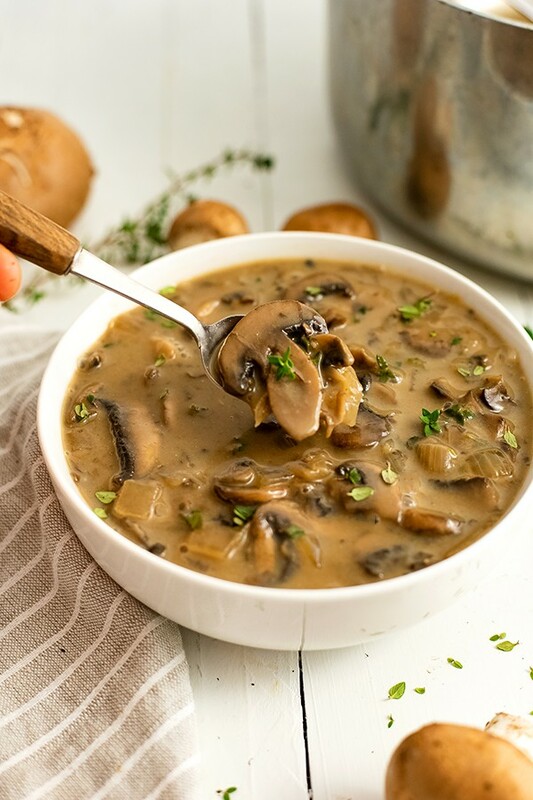 This week, after making a mushroom heavy stock (from Serious Eats blog) I was dying for a good mushroom soup and wasn’t in the mood to mess around with all their complications today and suspicious. Searched online and there you were! SO HAPPY I didn’t! Yours is the VERY BEST I’ve ever had. And I’m sorta picky LOL. Thank you so much. I’m eating it all day today in Florida 32 degree weather! The coldest days are the best days for this soup, Alyr! So happy you found it and made it! I adored this soup! I made it with my mom and it was fun and tasty! We added shiitake mushrooms, garlic and Herbs de Provence which was so lovely and aromatic. Can’t wait to make it again! Thanks so much for this one! Love it! Thanks for adding your version of the soup, Dani! Great soup! I like a lot of flavor in my food, so I added white wine, pepper and a little hot sauce. I had 3 helpings! We also have a nut allergy in our family so I am using hemp coconut milk – concerned it may come out too “coconut”flavor, but it’s cooking now so we will see! I used leeks instead of white onions, stay tuned! Hi Barbi ! How did it turn out using hemp milk? OMG! 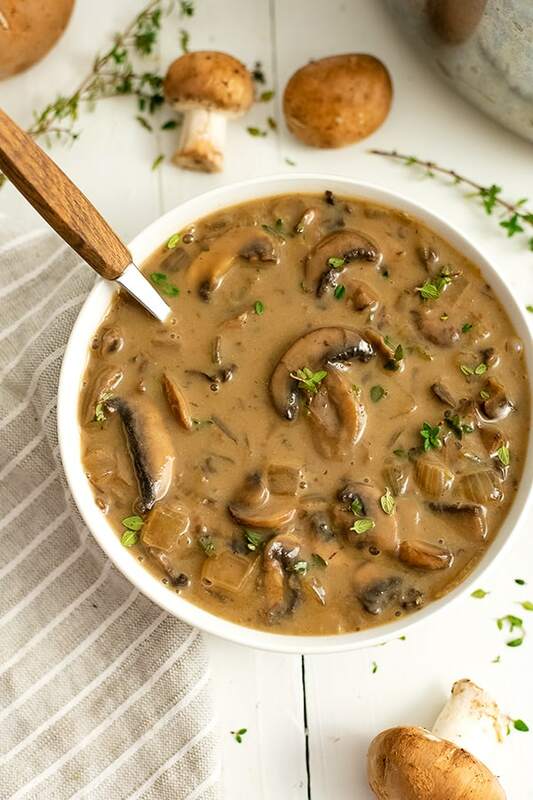 This IS the best mushroom soup EVER! I never leave reviews, but this tasted so good that I felt obligated. I doubled everything in the recipe except for the mushrooms and used rice milk instead of almond due to nut allergies. I ate a bowl of this for dinner then used the rest to make a green bean casserole. This recipe is going in my recipe box, thank you!!! Tami, I’m so excited you loved it! Thank you for leaving a review. It made me jump up and down! Appropriately named! I am in heaven eating this right now. The only adjustment I made was adding garlic in the beginning. The flavor is mellow and savory and just perfect! My only complaint is that I only made a single batch! So happy you loved in Jo! I’m curious how you get your nutrition information. I have to be very careful about potassium and the amount listed is huge – half my daily allowance. But none of the ingredients that I’m familiar with are very high in potassium. Not sure about coconut milk since I only use rice milk. I’d love to try this recipe but I’m just not sure. The recipe info pulls from an online database. You can easily do an import of the recipe to your favorite calorie tracker like My Fitness Pal to potentially get more accurate info. 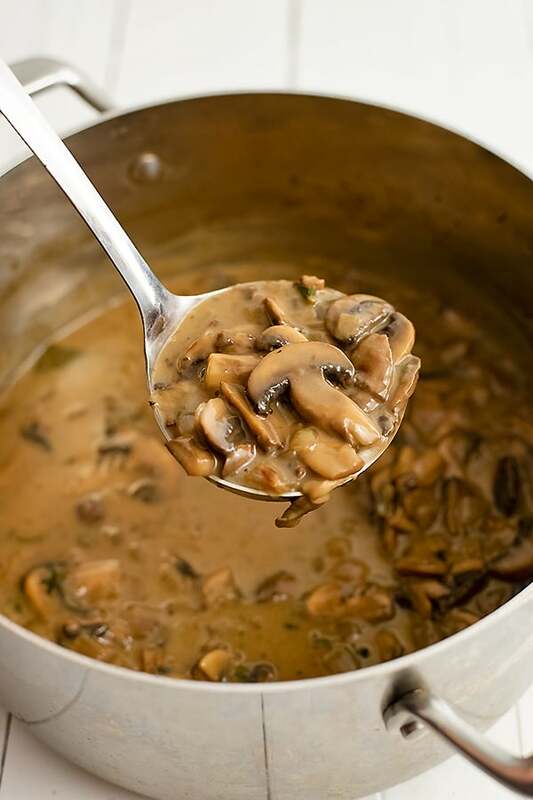 One half cup of mushrooms has 280 milligrams of potassium. I’m so happy you loved it Robin! Thanks for letting us know about your change we will need to try it! Just a warning though if you are making it for a vegetarian or vegan do NOT add Parmesan cheese as this is not suitable for vegetarians. After reading that it tastes even better on day 2, I decided to make this tonight for lunches for the next few days My initial sneak taste was AMAZING! Could you make this is a crock pot, do you think??? I’ve never tried it in a crockpot. But now I’m going to try and I’ll let you know! I have not tested this in a crockpot. I am making this for the third time today, and just wanted to add to the chorus of compliments! Thanks for Such a great recipe! You can get tapioca starch (manioc) in many oriental food stores and there it is inexpensive. You weren’t kidding, this soup is amazing! I didn’t think I would be able to recreate it well, but the simplicity left little margin for errors and it came out fantastic! Thank you for the awesome and easy to follow recipe. Delicious Kathie! It’s a staple in this house! 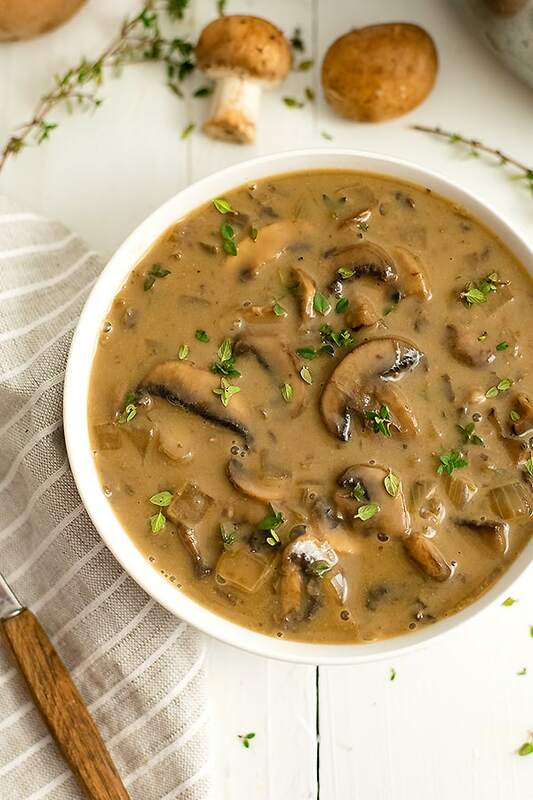 I made this a while ago and remember thinking at the time “This IS the best mushroom soup.” Now that cool weather is upon us again in Chicago, am making it again today. Thanks for this lovey recipe. SO DELICIOUS! This is a mushroom soup that even had someone who doesn’t like mushrooms helping themselves to a second bowl!! I love (but bought too many) mushrooms so tested this out tonight. I used coconut milk, Vidalia onions & fresh sage/ rosemary from the garden. From the comments, it seems you really can’t go wrong with any combo. My boyfriend isn’t a fan of the texture of mushrooms, so the immersion blender came out for a bit at the end, but that was a win-win. Though I am a bit bummed that I have to share..! THANK YOU for a great, healthy recipe! What would you suggest I replace the onion? 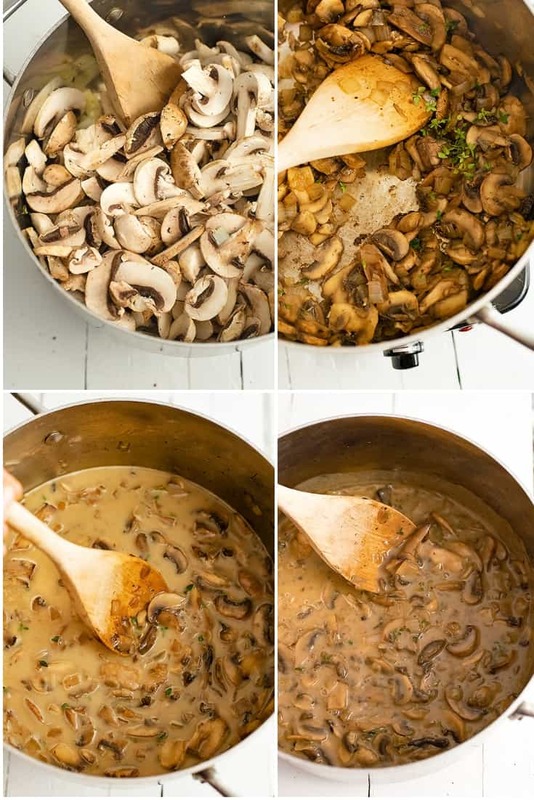 This is great- and it’s even BETTER if, once it’s ready, scoop out about 3/4 of the mushrooms and onions, puree them, and add them back to the soup. WOW! I also added some Magic Mushroom Powder- google the recipe. It’s yummy! Thank you! 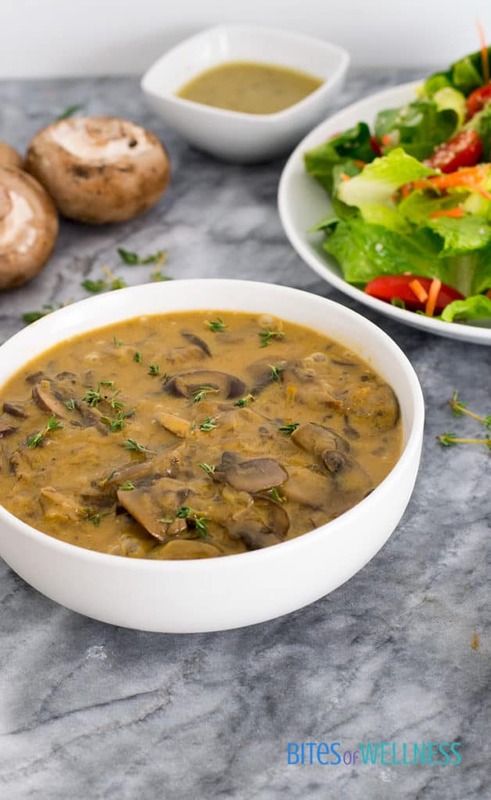 I have only eaten creamy mushroom soup and since having to give up milk had assumed that mushroom soup was one of those things I could never have again, like butter, cheese and cream. But this is good! Missed it for thirty years without having the imagination to experiment. Thanks for the wake-up! Used shiitake rooms fresh from the local grower and thyme from the garden. it was great! 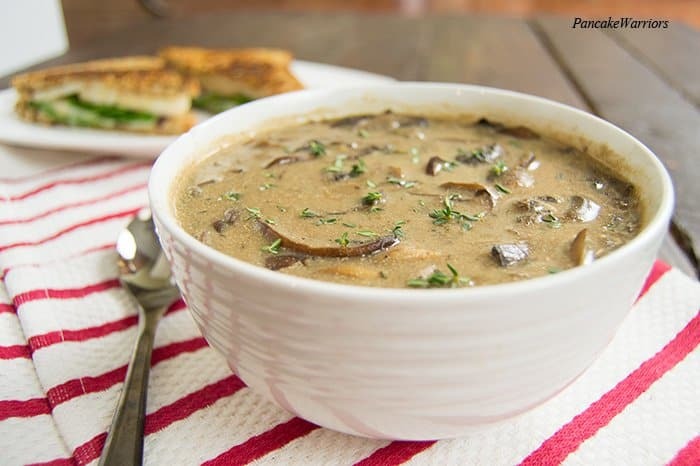 I like all types of soups , but soup with mushrooms is something that makes me to feel better! 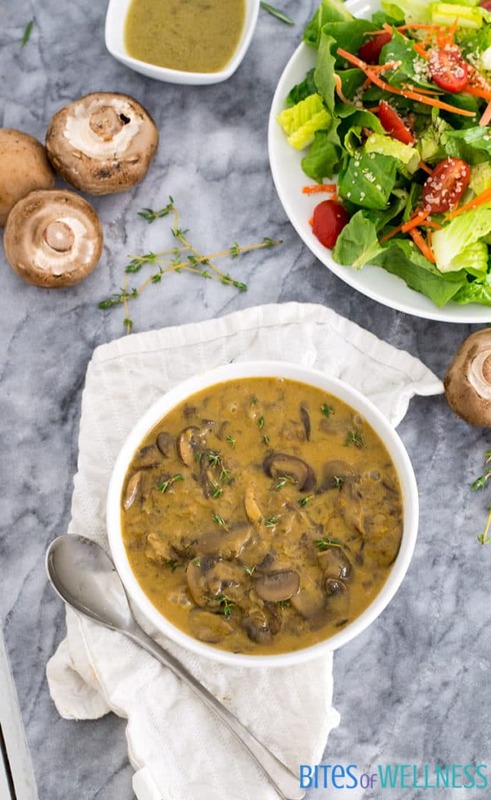 As mushroom lover i’m saying that this recipe is great! Made this today with multiple kinds of mushrooms…yummy! I’m not 100% Vegan, so made with home made chicken bone broth and pureed about 1/3 of the mushrooms at the end to make a thicker soup. Will definitely make with veggie broth, when I have home made on hand. What a fabulous recipe. I used soy milk and freeze-dried thyme leaves instead of the sprigs and quadrupled the recipe. One request/suggestion: Post a weight or measurement for the chopped onions. My onions were very large, so I used only three, but I was uncertain about the quantity. 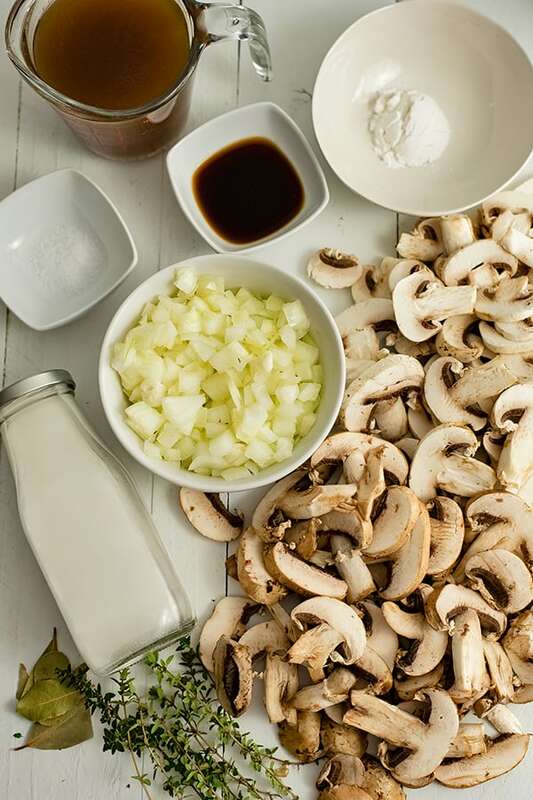 For anyone trying this for the first time: The amount of solids (chopped onions and mushrooms) appears very large, so much so that you’d never expect there to be enough liquid to make it work. But, everything cooks down beautifully and results are great. Used organic unsweetened coconut milk, added 1/8 cup masala and 1-tbs. imitation beefy onion soup mix (no beef in it), & put my thyme in cheese cloth because I’m too lazy to clean the stems. It was umami good!! Thank you for your awesome recipe! !